Well, I only know Marty Feldman as Igor in Young Frankenstein, but hey, I'm sure this biopic play will fill in the blanks! Jeepers Creepers is tailored to an extraordinarily specific audience: die-hard fans of obscure 1970s comedians. 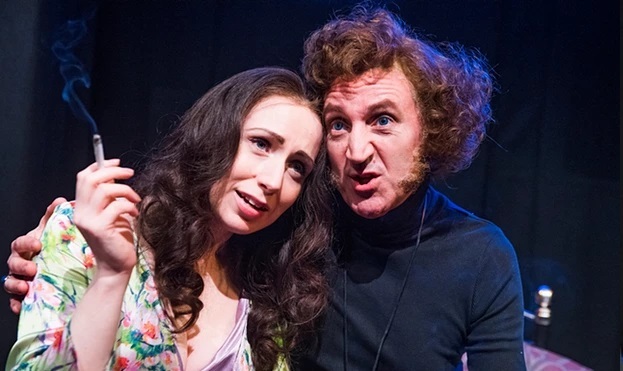 Split between a few distinct time periods, we spend 90 minutes in the company of Marty (David Boyle) and his put upon wife Lauretta (Rebecca Vaughan) as they bicker their way through a box of fags and neat spirits. We cover his excitement and ambition during the production of Young Frankenstein in 1974, his abortive efforts to establish himself in Hollywood whilst maintaining his artistic credentials in 1978 and his booze-soaked demise in a Mexico City hotel in 1982. A successful biopic should achieve two important things. Firstly, to do justice to its subject and provide fans them with a new viewpoint on their personality, behaviour and legacy. Secondly, it should explain to anyone unfamiliar with the subject precisely why they're worth paying attention to. A truly successful biopic should transform non-fans into fans and leave them wanting to learn more. Jeepers Creepers not only fails to explain why Marty Feldman was important, but made me actively dislike the man. What's blindingly obvious in the first couple of minutes is that Boyle's Feldman is incredibly annoying. Looking somewhat like Noddy Holder, he bounces around the room like an excited poodle, spouting an apparently endless series of bad jokes and self-pitying pabulum about how he's unappreciated as an artist. His audience is his wife Lauretta (Rebecca Vaughan). Her role is to lounge in bed, smoke, listlessly browse Vogue and profess her love for Feldman despite his constant and boastful infidelity. I have no idea what she sees in him - I only spent 90 minutes in Feldman's company and I was crawling the walls. And y'know, kind of importantly for a show about a comedian - it's not funny. I was busy on press night, so saw it on a regular evening. I can only assume that paying punters must be Marty Feldman fans, or at minimum Python fans that're familiar with his work. Yet the crowd sat in stony silence, punctuated only by muffled coughs and the uncomfortable shuffling of numbed butts. The most interesting thing that happened was also the most awkward. Sat next to me in the front row was a guy with dwarfism. I'd had a brief chat with him before the show began, and from what I could gather he seemed relatively enthusiastic about Feldman. Then, about mid-way through the first act there was a teeth-grittingly uncomfortable series of crappy jokes at the expense of people with dwarfism. I flicked my eyes right to see fingers gently tightening around a water bottle. He didn't return after the interval and I can't say I blame him. I felt bad for him. I felt bad for the actors to having to deliver those lines in his presence. I felt bad for me to have to witness it all! It would be hyperbole to describe Jeepers Creepers as a spectacular failure: this is a small-scale labour of love on a slim budget in a confined space. But it is absolutely a failure from top to bottom. It's a little mindboggling that this was directed by the undoubtedly talented Terry Jones, former Python and former friend of Feldman. Being as charitable as I can, he's having a seriously bad off-day. I knew almost nothing about Feldman as I arrived and I left with zero desire to know more. Maybe he really was an unrecognised comedy genius, but you'd be hard-pressed to tell from this bafflingly misjudged play. Jeepers Creepers is at the Leicester Square Theatre until 20 February. May God have mercy to the cast. Tickets here.